One sign read: Canadians Against Islamization. 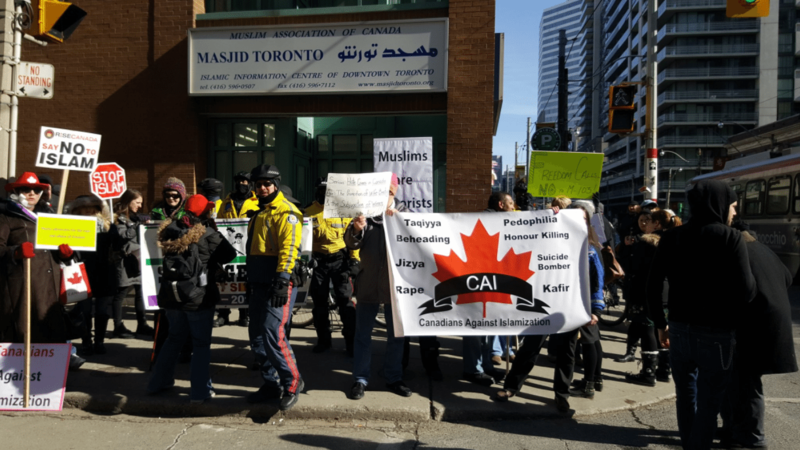 Protesters outside the Muslim Association of Canada. Photo used with permission, courtesy of Twitter user @SafiahC. Protesters gathered at the entrance to the Muslim Association of Canada’s Masjid Centre on Dundas on February 17, according to pictures circulating on social media. The protest started around noon and dispersed by around 3 p.m., soon after a different group of Torontonians arrived with signs sharing messages of inclusion and support for the local Muslim community, the Ryersonian reports. 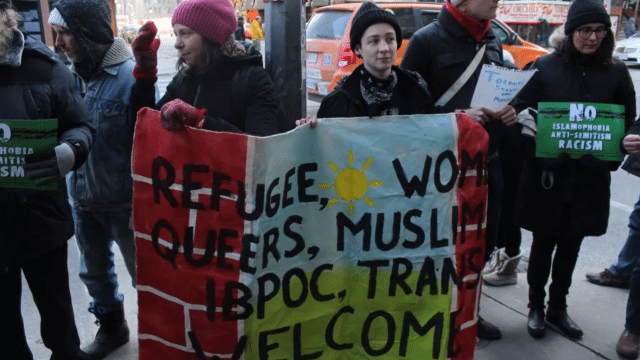 The demonstration comes just days after Rebel Media’s “Freedom Rally” at Canada Christian College February 15. Sending love to the Muslim community in Toronto as they have to deal with this garbage outside the mosque. Really terrible. Counter protesters declare that all are welcome here. Photo used with permission, courtesy of Jaclyn Tansil at the Ryersonian.